Finkelstein, Maxwell W.. "Aulavik National Park". The Canadian Encyclopedia, 25 January 2018, Historica Canada. 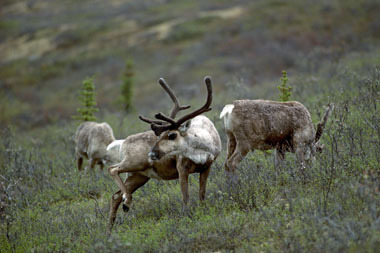 https://www.thecanadianencyclopedia.ca/en/article/aulavik-national-park. Accessed 25 April 2019. Centred on the wide Thomsen River valley on Banks Island, Aulavik National Park (set aside 1992, 12 200 km2) has an Inuvialuktun name that means "where people travel." The name was suggested by one of the elders of Sachs Harbour, the only community on the island. 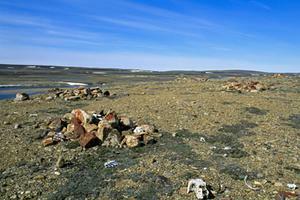 Ancient hunting site near the Thomsen River (courtesy Parks Canada). Access to the park is by charter aircraft from Inuvik, about 800 km southwest of the park. It is one of the least visited parks in the system. Most visitors raft or canoe the Thomsen, Canada's most northerly navigable river. 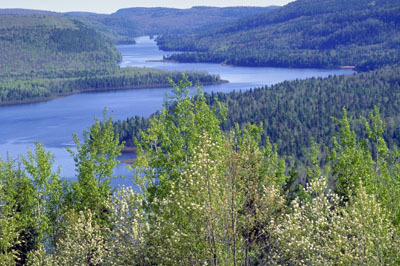 The Thomsen River valley is the most productive area in the world for muskoxen. About 25% of Banks Island's population (at least 47 000) of these shaggy beasts roam the dwarf willow, sedges and grasses of the valley wetlands. 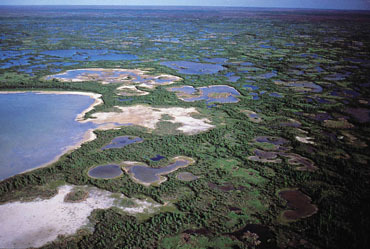 The Lower Thomsen River, with its adjoining lakes and tundra ponds, is designated as a migratory bird sanctuary because of the large numbers of Brant geese found here. On the west, the river is flanked by an arctic version of badlands - a landscape of deep, branching ravines providing breeding habitat for peregrine falcons, gyrfalcons and rough-legged hawks. To the east, beds of sand, shale and silt with occasional seams of coal and carbonaceous shales contain fossil plants and trees from the end of the age of the dinosaurs, over 65 million years ago. Archaeological sites dating from 3400 years ago are evidence of the area's rich cultural heritage.